Limited Inventory Available, order now! 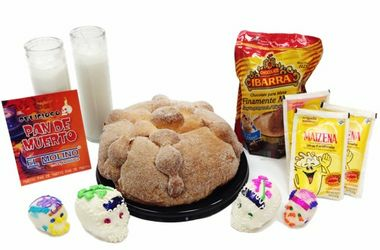 MexGrocer te manda un paquete con todo lo que necesitas para celebrar el Dia de Muertos en tu casa y pongas tu altar. Decoralo con flores y fotografias de tus familiares para conservar esta tradicion. The gift pack was the perfect everything to make the celebrations wonderful. From the soft, rich doughy brilliance of the pan to the magically melting goodness of the sugar skulls and the warm luxurious tastes of the chocolate, it was heavenly. The most thoughtful aspect was the candles to complete this master piece of a gift pack. Excellent Products for the Price! I ordered this gift pack for my altar and for my family to enjoy for Dia de Muertos. It arrived super quickly and just like the description, the Pan de Muerto was super fresh and delicious too! Everything in the gift pack was in excellent condition. For the price, I will definitely order again! The Pan de Muerto arrives separately, fyi. I wasn't aware of that, but once I received it, I knew why it had to be shipped separately. The large sugar skulls were so beautiful and just perfect for my altars. Thank you, Mex Grocer.com! You've made a customer for life!